Known for reaching lofty heights of 75 feet or more, walnut trees (Juglans spp.) are prized for their beautiful wood, delicious nuts and shade-producing canopies. When walking through the eastern United States, the types of walnut trees you're most likely to encounter are black walnut trees (Juglans nigra), which are native to the area, and English walnut trees (Juglans regia), which came to the U.S. with European settlers. Both are deciduous trees that do best in U.S. Department of Agriculture plant hardiness zones 4 through 9. While there are a few differences between these two species that will allow you to differentiate between them, both share common characteristics that will help you identify them as walnut trees. The first step in walnut tree identification is to look at your surroundings. Your location won't confirm beyond doubt that you're looking at a walnut tree, but it can tell you if you're not. Walnut trees like quality soil and don't take kindly to wet feet. If you're in a swampy area or one that floods often, the tree you're looking at probably isn't a walnut. Looking at the ground is also helpful. The ground around a walnut tree is usually littered with dropped nuts and walnut shells left behind by hungry mice and squirrels. If you're looking at a black walnut tree, what you don't see can help you make a positive identification. 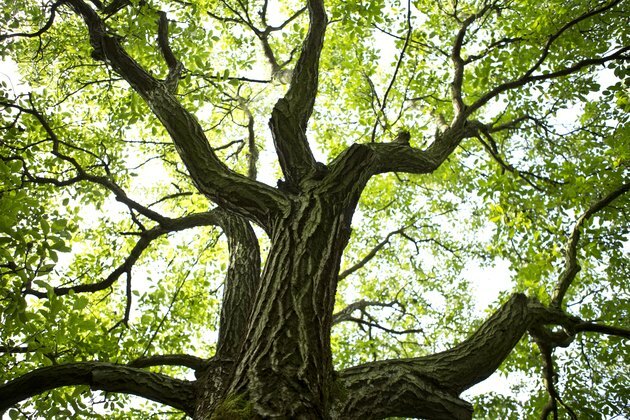 Black walnut trees produce a toxin called juglone, found in all parts of the tree. Juglone leeches into the soil where it can stunt or kill susceptible plants. Plants susceptible to juglone and not likely found near a black walnut tree include pine trees (Pinus spp. ), chestnuts (Castanea), azaleas (Rhododendron spp. ), lilacs (Syringa vulgaris), blueberries (Cyanococcus spp.) and privet (Ligustrum spp.). Gray in color, walnut tree bark is rough and full of deep ridges and valleys. These ridges run vertically up and down the tree trunk and have rounded edges. If you remove a piece of bark from the tree, you'll find a rich, deep chocolate brown color hiding beneath the tree's gray exterior. The bark is especially helpful in identifying walnut trees in the winter when they've dropped their leaves and aren't producing walnuts. In the spring and summer, walnut trees produce feather-shaped leaves. Each stem contains multiple leaves in a row on both sides and a terminal leaf on the end of the stem. Walnuts typically produce five to nine pairs of leaves per stem, but leaf pairs don't sit directly across from each other. Instead, the leaves are slightly staggered like steps along the leaf stem. Green in spring and summer, walnut leaves turn yellow or brown rather than red or orange in the fall. If you're still not sure if you've got a walnut tree, crush a leaf in your hand and smell it. Crushed walnut tree leaves give off a distinct odor that smells like spiced citrus. Inside of a tree's twigs is a substance known as pith. Pith is a soft, spongy tissue that the plant uses to move nutrients to where they're needed in a similar manner to your circulatory system. Some trees, including walnuts, contain chambered pith. Instead of being a solid mass of tissue, chambered pith gets broken into sections by tiny dividers within the twig. To check the pith, remove a small twig from the tree and cut it in half lengthwise. As you hold the twig vertically so it's perpendicular to the ground, look for tiny horizontal lines running across it. These lines are dark brown on black walnut trees but are light tan on other varieties. If you see these lines, you're looking at a tree with chambered pith and quite possibly a walnut tree. Like bark, pith allows you to identify walnut trees during the winter months. Clearly, walnuts appearing on your tree in the fall is the number one indicator that you have a walnut tree. The nuts on your tree won't look like the ones you find in the grocery store, however. The nut itself forms in a brown, textured shell that you can crack open with a nutcracker. On the tree, however, this brown outer shell is covered by a green casing reminiscent of a small tennis ball. This outer hull is extremely tough and difficult to crack – so much so that a common way of opening them is to line them up in the driveway and drive over them a few times with a car! Now that you're pretty sure you have a walnut tree, you likely want to know whether it's a black walnut or an English walnut. There are a few clues to help you tell them apart. One is age. Black walnuts take 12 to 15 years to mature fully and start producing walnuts. English walnut trees, however, bear fruit much earlier at four to eight years after planting. Although it produces fruit much more quickly, the English walnut tree is a bit more lackadaisical about producing new leaves in the spring. It will be one of the last trees in your yard to leaf. The nuts themselves are different, as well. The inner shell of a black walnut is quite dark and will stain your hands, clothing and just about anything else it comes in contact with. While the black and English walnuts are the most prevalent in the United States, there are about 20 different species of walnut tree. If you don't think you have a black or English walnut, visit your local garden center or extension office for help identifying your tree.